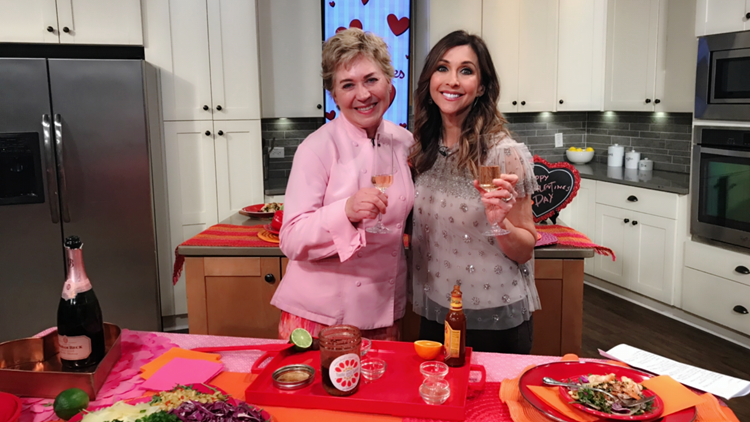 Taste and Savor's Chef Nancy Waldeck shares recipes perfect for your 'Galentine's Day' parties with the girls! Toss the salad together and drizzle with the mole vinaigrette. Shake all the ingredients together in a jar. 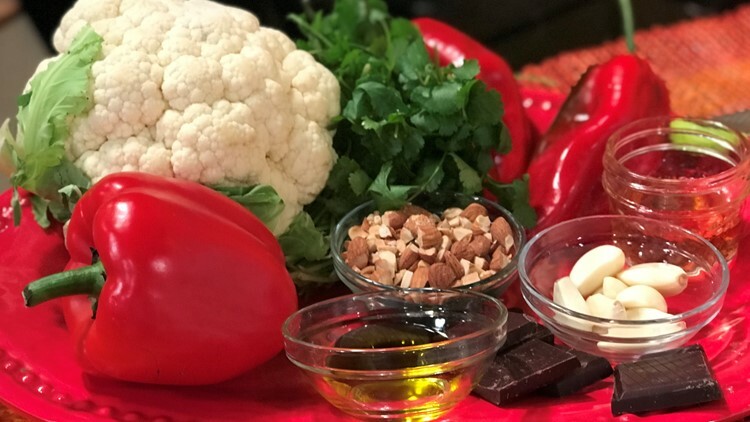 Roasted Cauliflower and Peppers with Picada – A Spanish/Portuguese style sauce. Preheat the oven to 400F. On one sheet pan, toss the cauliflower with about a TB of olive oil and place. Slide into the oven and roast for about 25 – 30 minutes or until edges are nicely browned. On another sheet pan, do the same with your peppers. While the cauliflower is cooking, heat the remaining olive oil and the garlic in a 12" skillet over medium. Cook until garlic is golden about 4–6 minutes, let cool. To make the Picada, Mix the almonds, parsley, sherry and dark chocolate together with the garlic oil and set aside. Toss the cauliflower and peppers together on a platter and drizzle with the Picada sauce. Its must be pink and sparkly! Cap Classique is what Sparkling Wine is called in South Africa. With lots of raspberry and cherry flavors, it's made with the same method as champagne - it's the perfect light quaff for the gals!